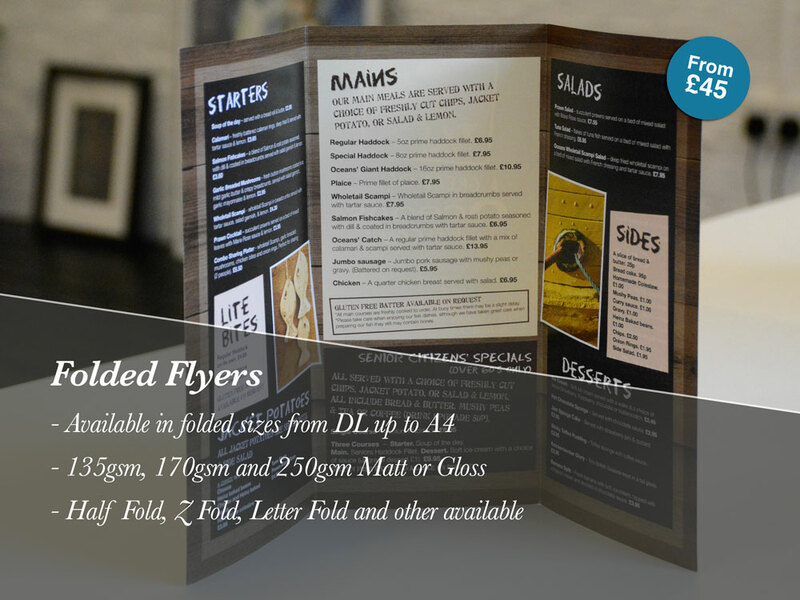 Folded flyers are most commonly used for takeaway menus and drinks menus, which stand on tables. They are commonly used when you need a larger area for information and then collapsed into a small and convenient size. The popular folds are Gate Folds, Tri Fold Roll fold, Letter fold cross fold, Z-fold and Map fold. Flyers are the most popular hand out form of marketing as it is so easy to fit the right amount of information onto a conveniently sized flyer. We tend to offer 130GSM and 170GSM for our flyers however thicker stocks are available as well. Deciding on the fold can be tricky especially as there are so many options to choose from. Of course, the purpose of the flyer will affect the fold you choose, for example, if your flyer will be used as a map you may opt for the Map fold. If your flyer is going to be used a drinks menu you may opt for a half fold in a heavier GSM to make more sturdy. At Leeds Printing Company we can advise you on the best options for you and try to help you to understand the different options available. Please don’t hesitate to get in touch to ask any questions. Prices below for double sided, full colour flyers on 170gsm gloss or silk. Folded Flyers are VAT exempt. Prices above are for double sided / full colour folded flyers on 170gm. Standard delivery time is 3-4 working days for quantities up to 1000 and 4-5 working days for quantities over. Orders need to be placed by 16.30 complete with print-ready artwork. Folded flyers are VAT exempt. What size folded flyers do you offer? We offer folded flyers on flat sizes of A3 to A5 as well as custom sizes in between. Please get in touch for a custom quote. What Stocks do you print folded Flyers on? Please note, with thicker stocks, creasing maybe needed at an additional cost – please get in touch to find out. What type of folds do you offer?